Numbers 14:21-24 but truly, as I live, all the earth shall be filled with the glory of the Lord-- because all these men who have seen My glory and the signs which I did in Egypt and in the wilderness, and have put Me to the test now these ten times, and have not heeded My voice, they certainly shall not see the land of which I swore to their fathers, nor shall any of those who rejected Me see it. 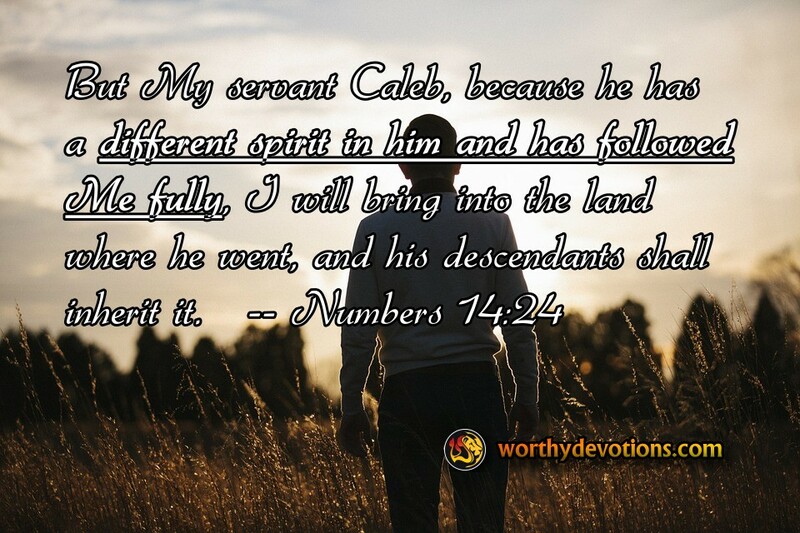 But My servant Caleb, because he has a different spirit in him and has followed Me fully, I will bring into the land where he went, and his descendants shall inherit it. In this NT passage Paul distinguishes the multitudes of Israelites who never entered the Promised Land, in that they never apprehended the destiny which God intended for them, but, instead, perished in the wilderness. The only adults that entered the Promised Land were Joshua and Caleb. What distinguished Joshua and Caleb? A "different spirit". It is astounding to realize that so many failed to apprehend this spirit, and Paul makes it clear that this example has the most serious implications for New Testament believers. The spirit of whole-hearted commitment, apparently rare as the finest rubies, receives the inheritance, the rich rewards of the "Promised Land". What this "Promised Land" may be for those who are as faithful in the present age, we may wonder. But be assured it will flow with "Milk and Honey" just as the Land of Israel did in those ancient days, (and is again experiencing today!) Following God "with all that we had" will qualify us for the greatest eternal rewards. So, while these are days of tremendous testing, we have the finest examples to follow: Joshua and Caleb, whose spirit was different, whose hearts were whole, and whose faith was built on the witness of God's repeated demonstration of His miraculous power. They knew they could afford to trust YHVH with all they had, and we can too. The Promised Land is waiting for those who will. This is the message needed now by ISRAEL'S and the IGBO'S to overcome their present hostilities. Jehovah changeth not. He Has promised and when we believe we receive. Faithlessness is as a sin of witchcrafts.